Baby Addison hit 6 weeks and we wanted a weekend getaway from London so we decided to go to Devon (about a 4 hour drive from central London – can be more with the painful traffic out of the city). 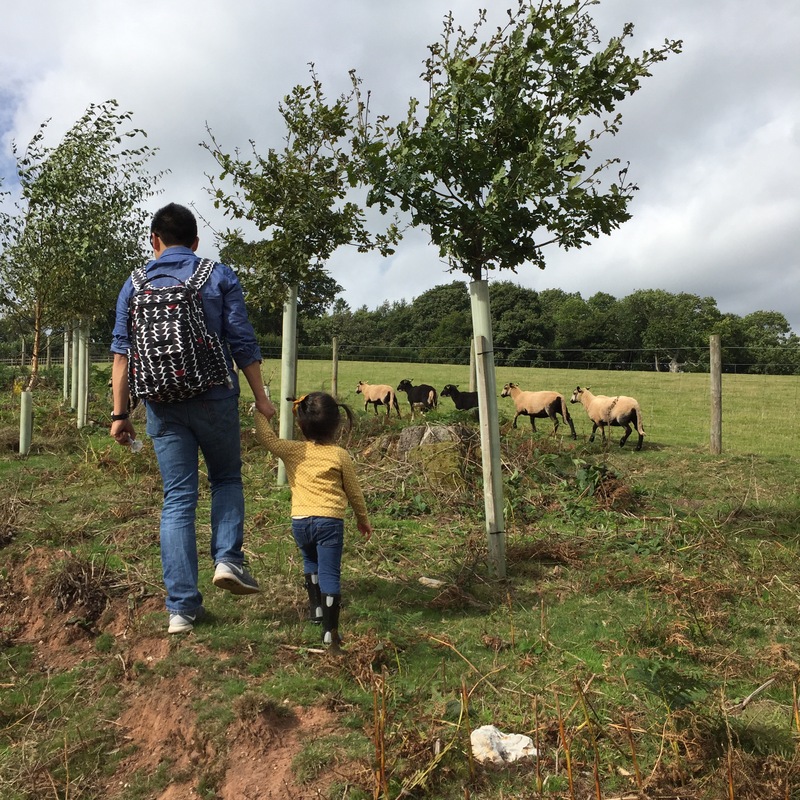 As now a family of 4, I started thinking early on what to pack for a 2 night trip with a newborn and 3 year old (I can’t forget myself too, but I did forget hub’s toiletries – apparently as wife you’re suppose to remember to bring his shaver and hair gel). And can you believe all of the above fit into our BabyBeau diaper bag? This diaper bag has it all and its so stylish in grey. One of the most unique qualities it has is the extra layer (silky soft material) inside to take out and wash should something spill inside the bag. Good thinking! Furthermore, if you take out the extra layer to clean, there is still another zippered side pocket to put accessories in or if you just don’t want these compartments in the bag. I would probably put my ipad/laptop in this area with the extra layer if I didn’t use it as a weekend bag. Compartments – there are also just enough compartments to find things quickly in BabyBeau. The 4 side compartments are soft on the hands when you’re sifting through the bag and a nice addition that it can be taken out easily should you just want to pack something that doesn’t need to be separated. The diaper bag also came with a nice diaper changing pad (that didn’t actually fit in with BOTH my kiddos things) and insulated bottle holder – both lovely accessories to match the bag. Inside the bag, there is also a detachable zippered pouch for small items (e.g. mommy items, snacks). I would have to say this bag is definitely well thought out and can transition with your family and doesn’t even have to be called a diaper bag, but a weekend bag due to its size (to note, I wouldn’t call the bag lightweight, but hey – it’s canvas with leather). 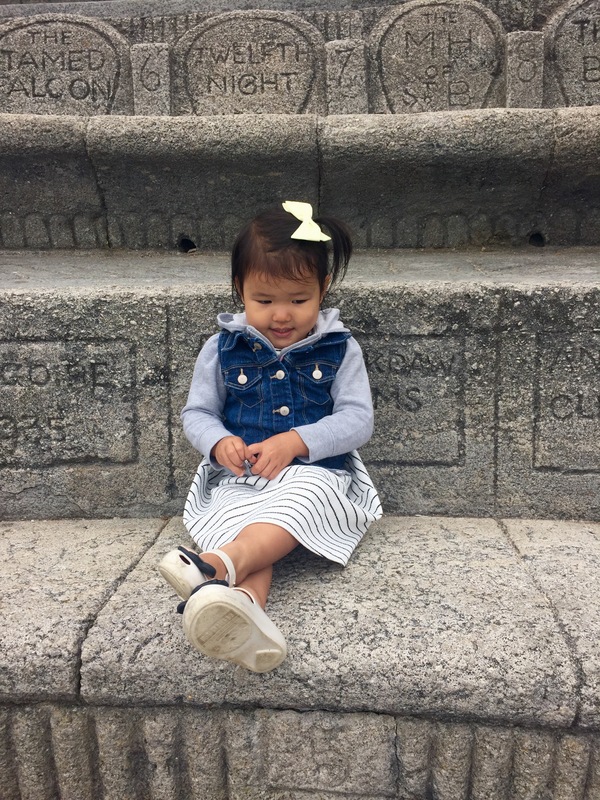 BabyBeau Isabelle can be compacted to look smaller with the hooks on both sides of the bag. The bottom of the bag also has the 4 metal balls so the material isn’t touching sometimes dirty floors. 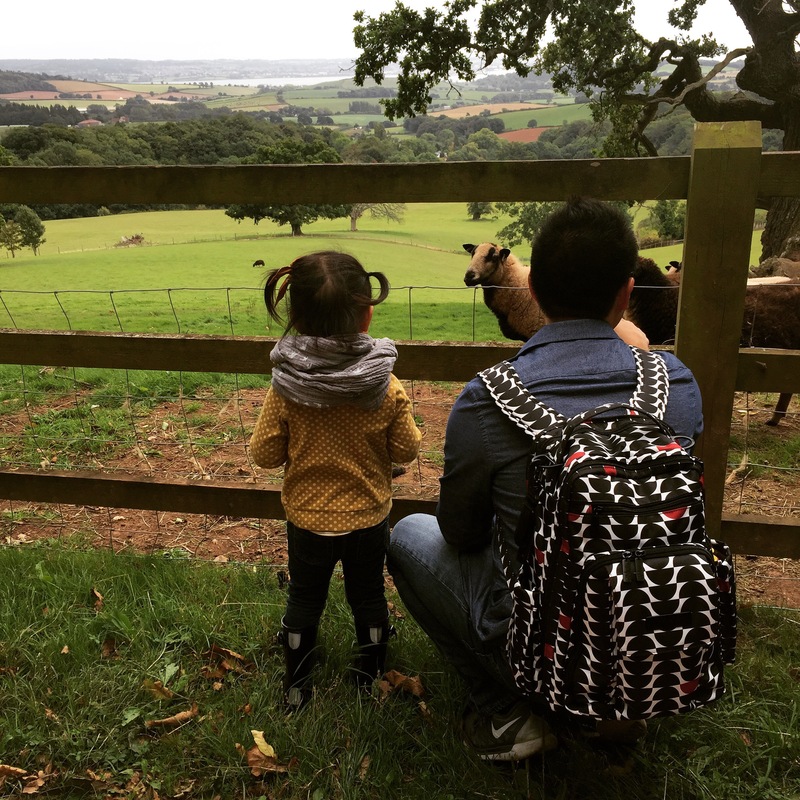 We travel light and only bring necessities, but we’re also lucky in that we (and the kids) don’t have special products that we can’t live without besides now the MiaMily hipster carrier.– a practical carrier where you can run some errands in and not have to bring a diaper bag as well. YAY! We used ours for the first time this weekend and LOVE it. I didn’t have the original MiaMily carrier and used the Ergo with baby #1 so here are my thoughts. 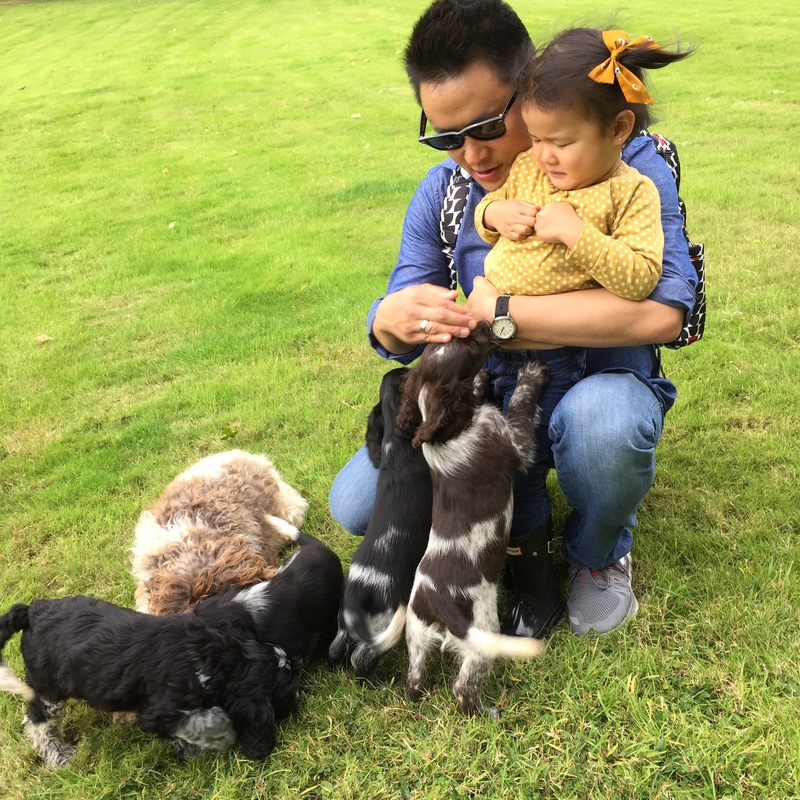 Carrier material is easy to clean and I was wearing a tank top so it didn’t hurt my shoulders or arms (no marks on me – it is also fall here in England so no feedback on hot weather, but for babe there is mesh lining inside which can be zippered down to be more breathable). Shoulder and waist straps are easy to clip together and velcro can be adjusted easily. Amazing feature is the zippered pouch below the seat of babe to put accessories in (e.g. bottle, diaper, phone, keys, snack) for some errands instead of bringing a bag. There is also a side mesh pouch to put a phone at – wow, MiaMily thought of everything! Any cons you might be thinking? I would have to say – hot, humid weather may be rough with the carrier and babe in it since the carrier isn’t a cotton material. Another thing is that it doesn’t fold into a super compact size, but it does come with a travel bag that can also fit the infant insert in it. 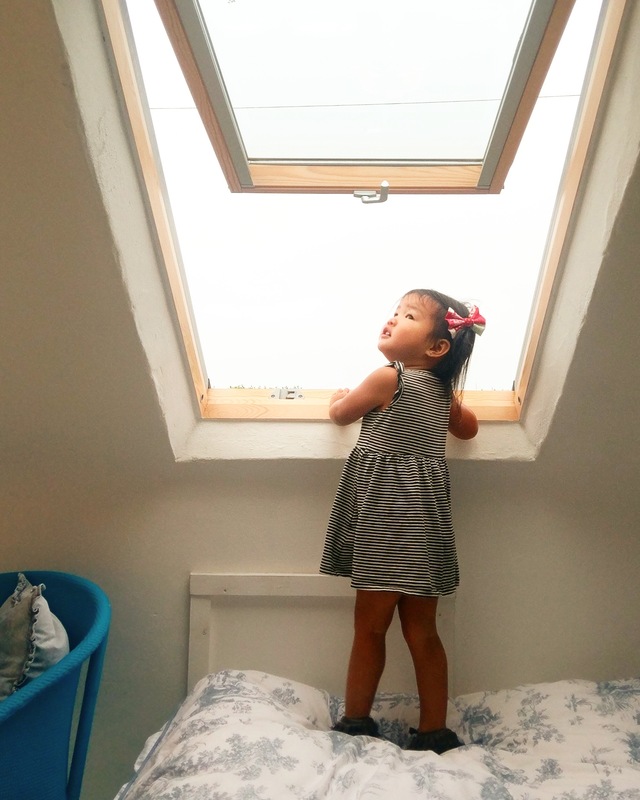 We chose to stay at an Airbnb for the weekend and found the cutest place – The Lakehouse. Our place overlooked our own little lake and it was so peaceful minus Addison crying a lot. 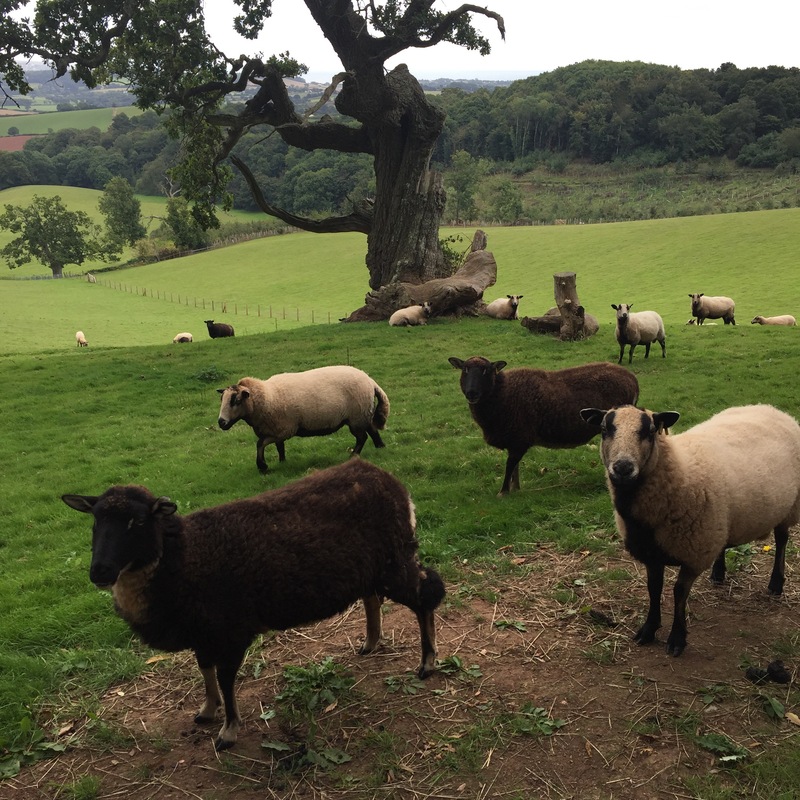 The owner also had sheep, alpacas, pigs, and dogs which absolutely made Abigail’s weekend to play and see them. 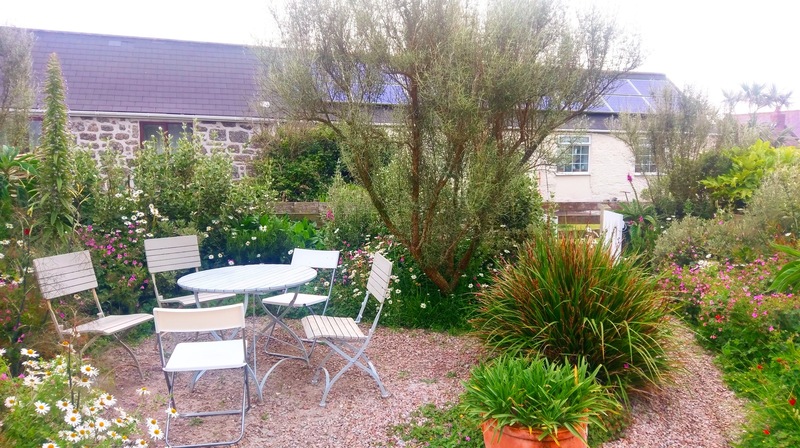 Beautiful countryside property and would highly recommend (one thing – bring your own toiletries, none provided). 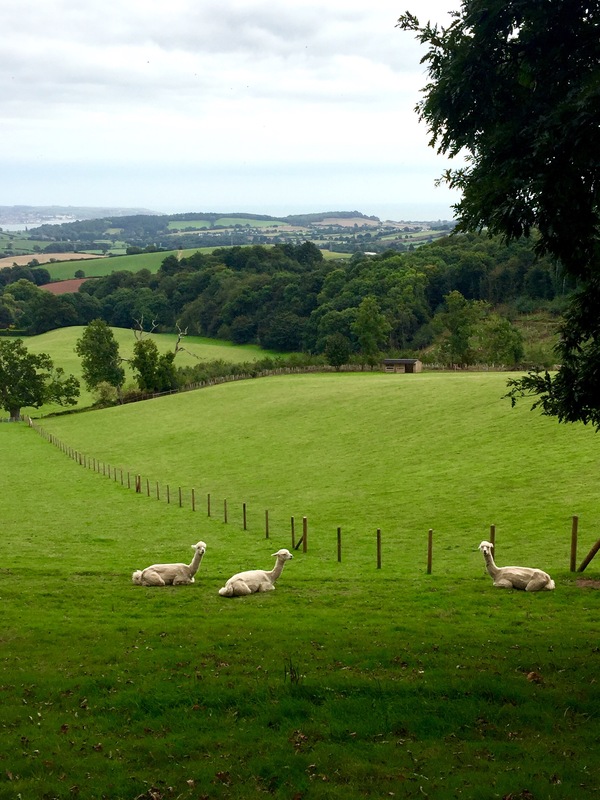 These alpacas were insanely cute and soft. 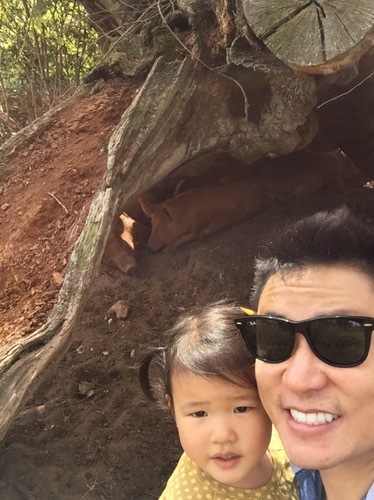 Daddy and daughter selfie with the pigs (piglets in the back too). We were going to do a baby animal petting zoo for Abigail’s 4th birthday, but seeing her with the cockapoos, probably not. The property. – this building was a Roman bathhouse back in the day. 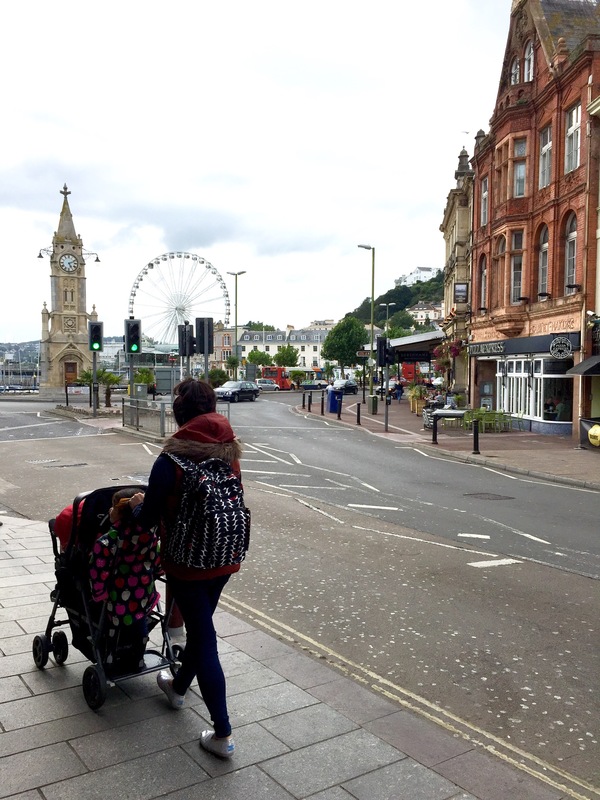 We also checked out the town before we left back to London in our Joovy. Abigail LOVES to roll in this as she can also keep a close eye on her baby sister. 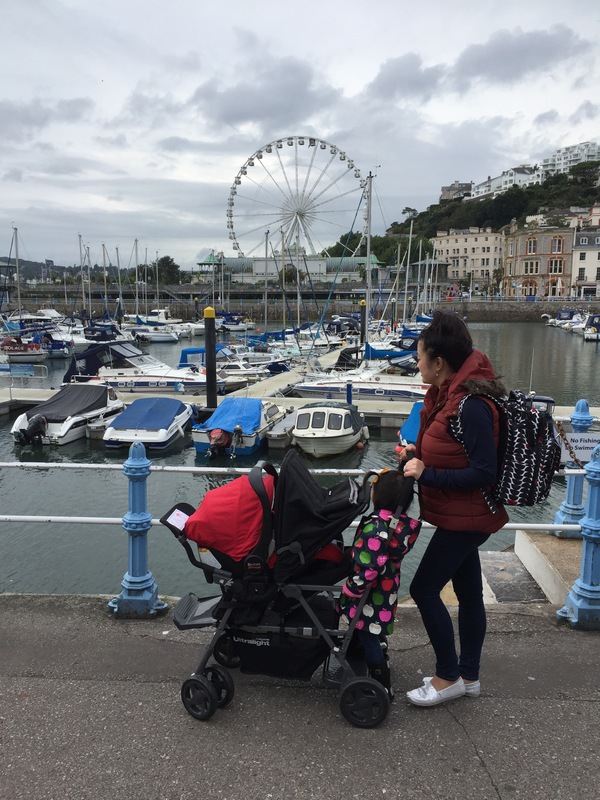 This double stroller is definitely more suitable in a spacious setting like here. Big perks – super smooth wheels, can put a car seat on it, and kickboard for toddler to stand on built in. Loved our much needed weekend getaway and looking forward to our next adventure in October. This is the last trip before “nesting” for baby girl #2. 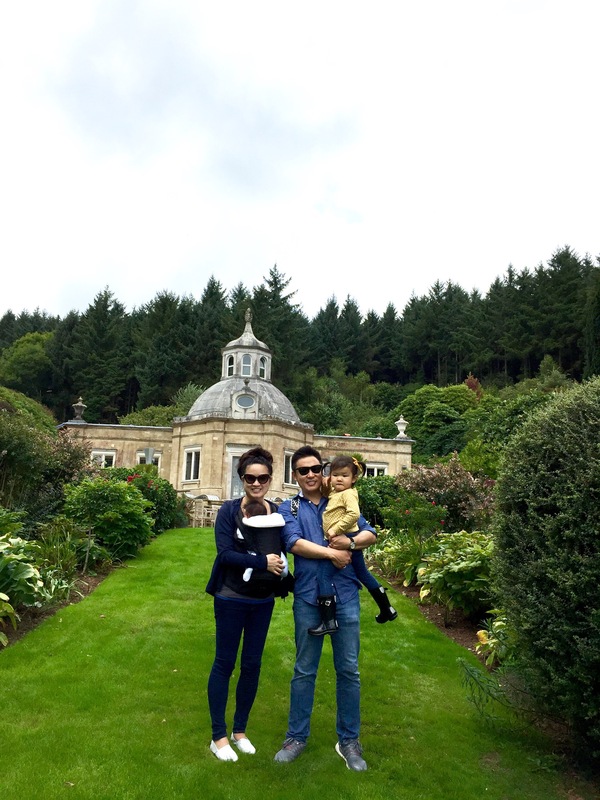 We opted for a road trip with our London buddies and had a blast – minus the cloudy/windy weather (really, July, come on!). We left London and didn’t get into Cornwall until early evening since we just had to make a pit stop in Bristol for Costco – warehouse (heaven) of bulk goodies. 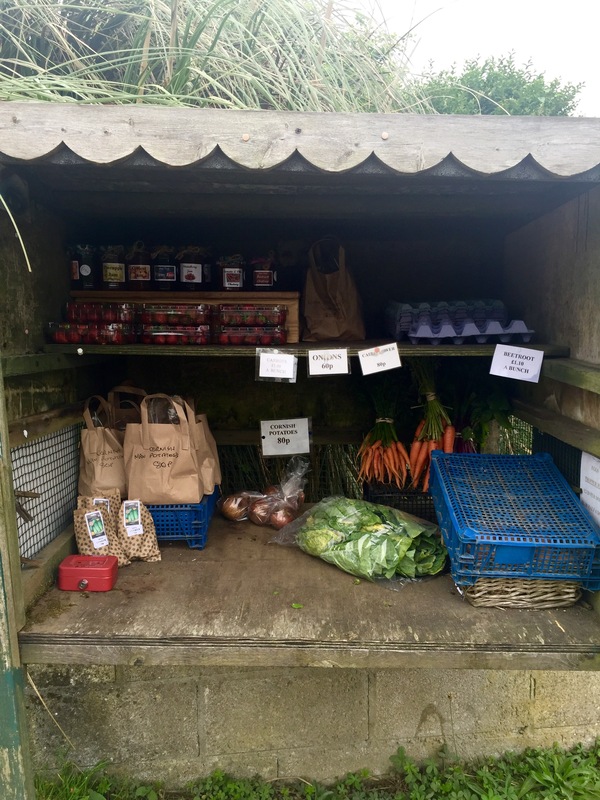 📷: Love their honor system of paying for things along the road (just leave the money in a box and take what you want). 📷: Fish n’ chips everywhere. 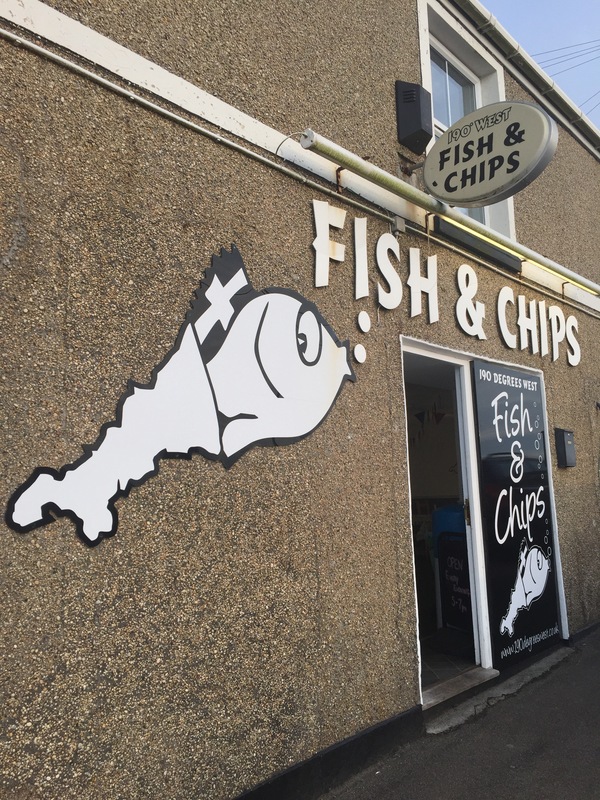 Our first Cornwall meal – super fresh fish of course. Why am I surprised? Love the stone houses throughout the city (we stayed in an adorable cottage that really did a stellar job with upping the look n’feel of their IKEA furniture). 📷: Abigail couldn’t wait to see the moon and stars with this sunroof. 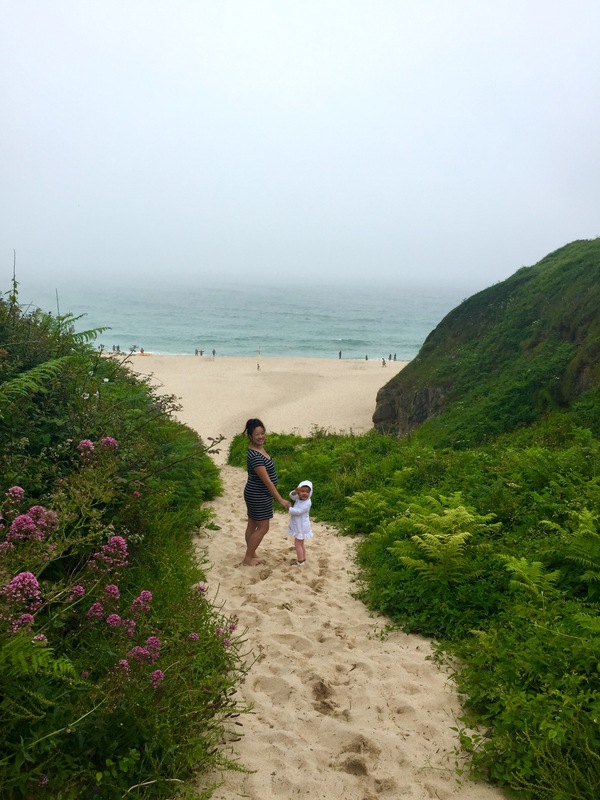 Anyhow, we promised the kids it would be about the beach on Saturday (rain or shine) so they got it. 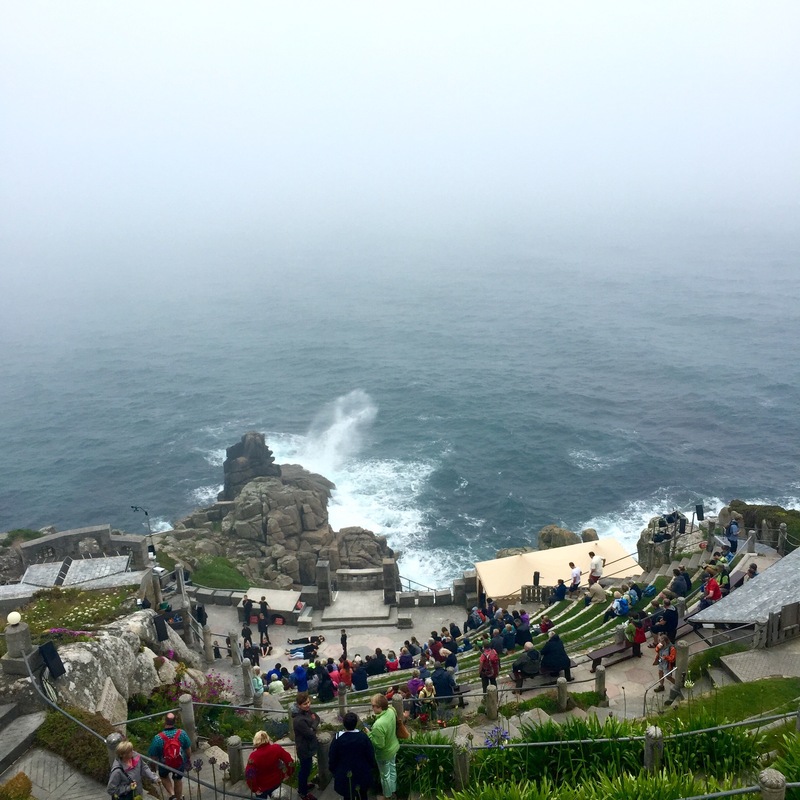 We did a stop at the Minack outdoor theatre (next to Porthcurno beach) prior and wow that is cool! Imagine watching a show outdoors perched on a cliff and hearing the Atlantic ocean water. Amazing and the stone seating had these cool engravings as well. 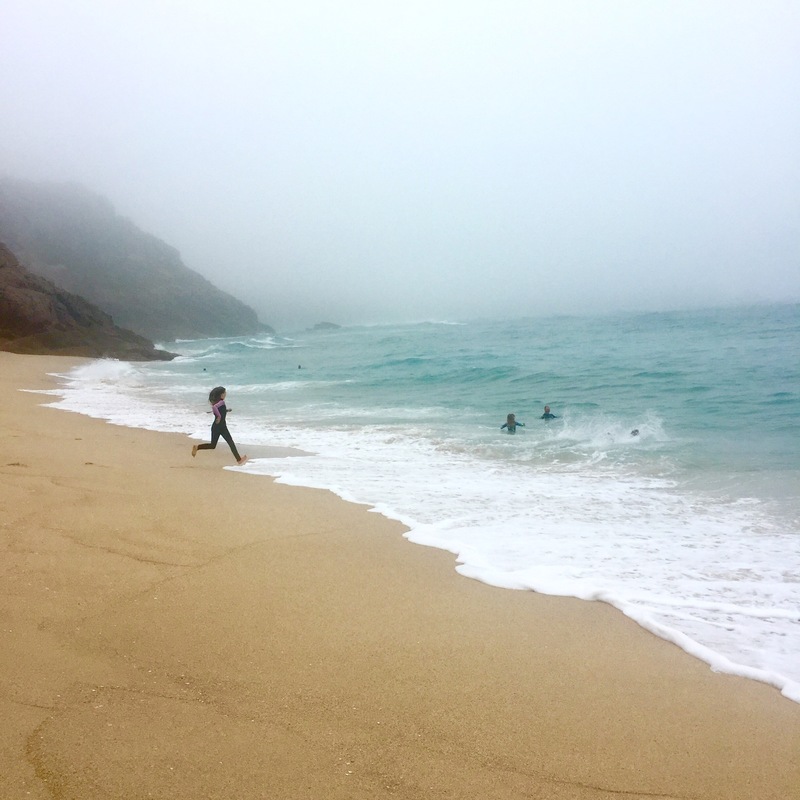 Misty and windy at Porthcurno beach – clearly overlooked once she saw the abundant sand. I would recommend this beach (lifeguard on duty) – nice sand, plenty of shells to pick, not too crazy waves, and water is gorgeous. 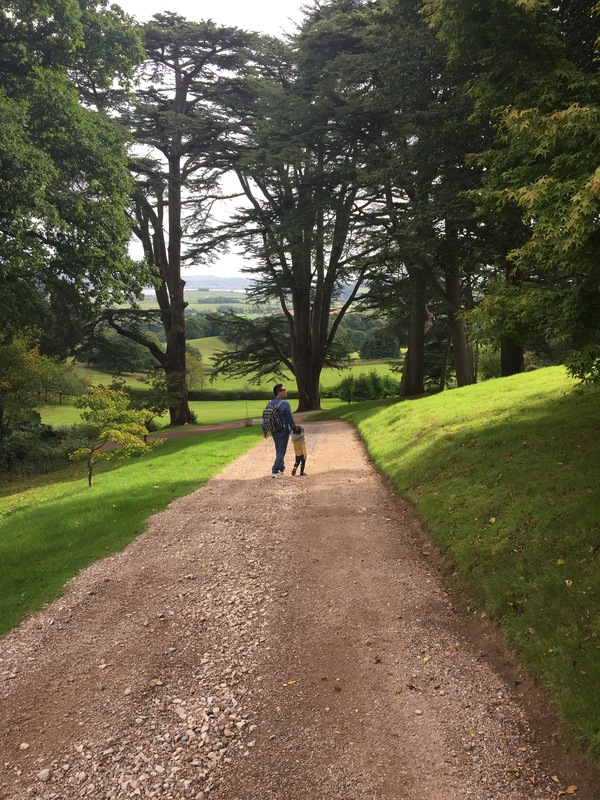 📷: Path we took from the car park. You can also walk down the cliff from Minack theatre. 📷:: Be inspired to take the plunge into the unknown. 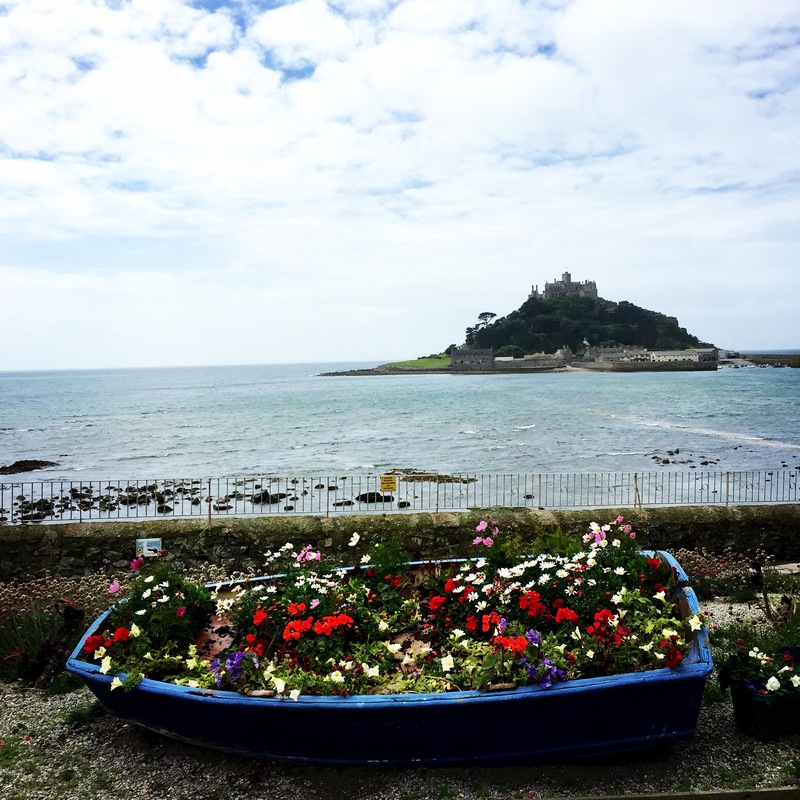 Saint Michael’s Mount – A must go! 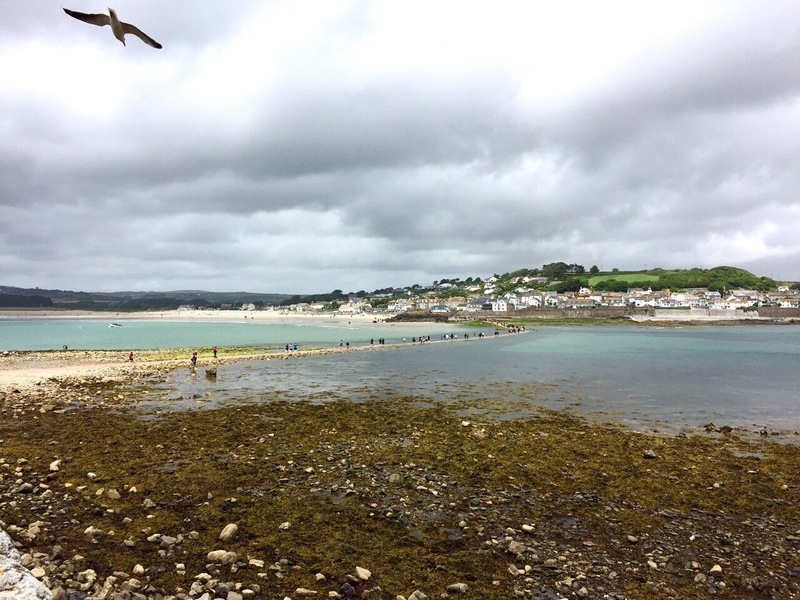 If you go after lunch, you can probably walk across the path but looks like before noon you would need to take a quick boat ride over (£2 adults, £1 child). 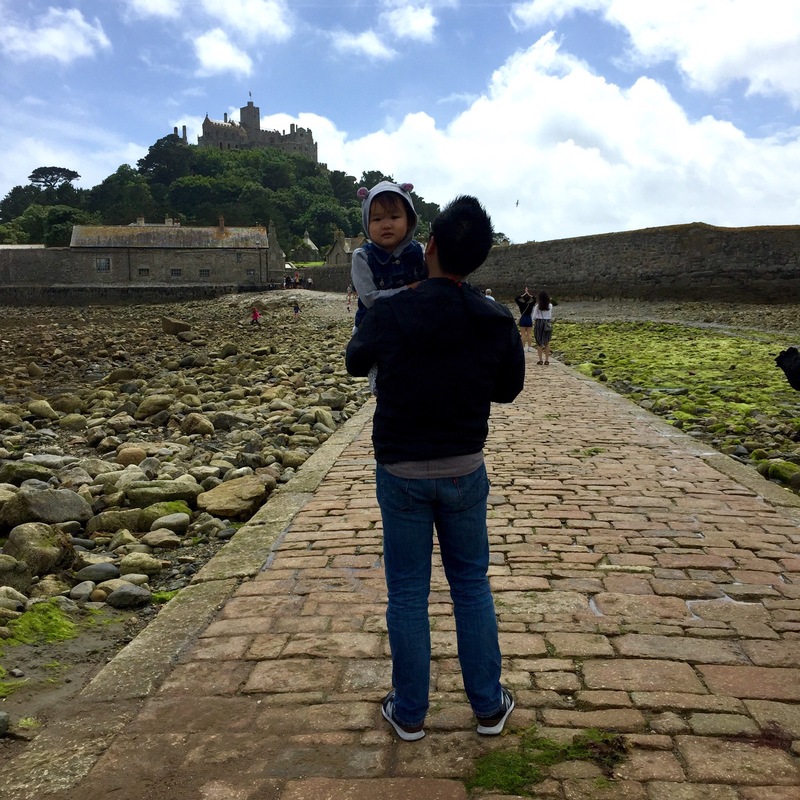 📷:: A serious historical sight to take in – Saint Michael’s Mount. 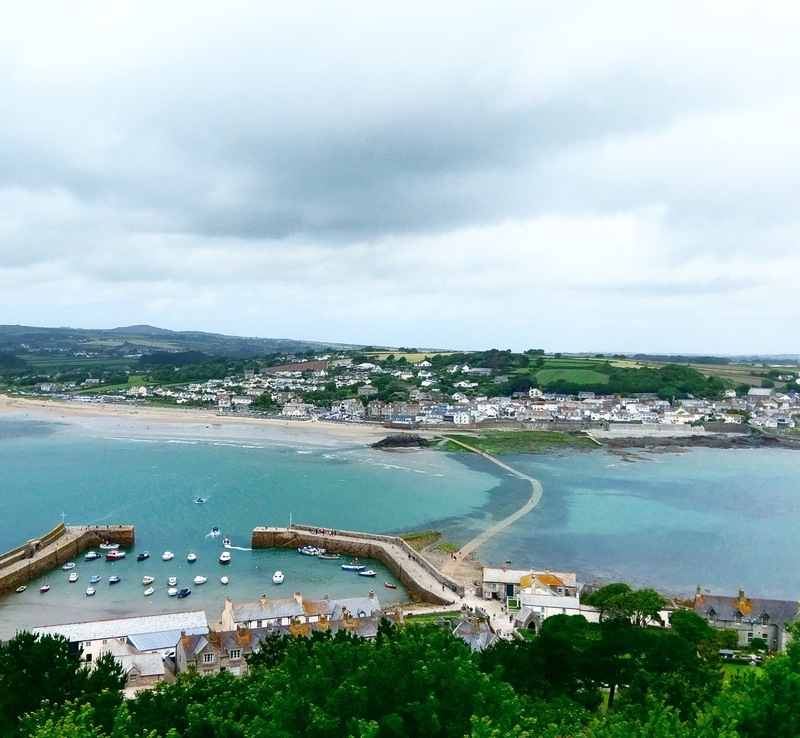 📷:: View from the top of Saint Michael’s Mount. Majestic! 📷:: View from Island Cafe (pretty good food & plenty of indoor/outdoor seating). 📷:: It’s crazy how the cobblestone walkway (approx. 500 metres) dries up quickly and isn’t slippery. And that wraps up what we did in Cornwall. Definitely would say we missed many sights and probably staying at least 3 nights would be ideal for both driving or training to Cornwall.